The “99 Virginia Football Thoughts Before Kickoff” series has looked at a few individual Cavaliers over the course of the countdown. Jordan Mack, Jordan Ellis, and Joe Spaziani have made appearances. One player that deserves some spotlight time is up in this entry. Olamide Zaccheaus. There are plenty of ways to discuss UVA football with Zaccheaus as the focal point. What’s on tap in this article? A year ago, Zaccheaus set a program record with 85 receptions in a single season. That broke a 16-year old record previously held by Billy McMullen, who hauled in 83 catches in 2001. That brought the three-year total to 157 receptions for Zaccheaus, who now ranks fourth all-time on the career catches list. He’ll have a shot at catching McMullen on that list too. McMullen is the program’s all-time leader with 210 receptions. That’s not what got me thinking about Zaccheaus for this article, though. Many players have caught at least 50 passes in a season and many have more than 100 receptions in a career. I’m curious if he can join McMullen on a much more exclusive list. In fact, it’s not a list really. It’s a duo. The single season 1,000 receiving yards club. 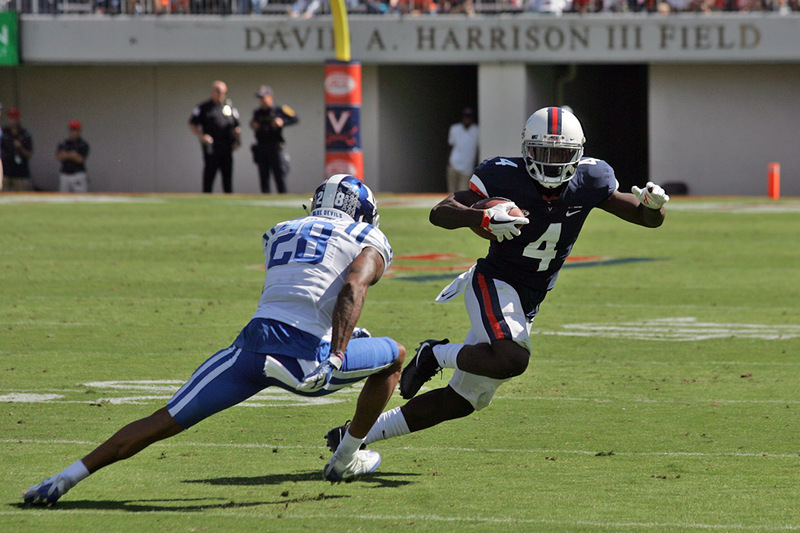 In UVA history, only two players made it to 1,000 receiving yards in a season. Herman Moore set the single season record for the Hoos with 1,190 receiving yards in 1990. (He did that on just 54 catches by the way – that’s 22 yards a catch!) McMullen joined him in 2001 with 1,060 yards. A few others have been close. Let’s call close in this case as within a 165 yards of 1,000 in a season. Germane Crowell (969 in 1997), Kris Burd (913 in 2011), McMullen (894 in 2002), John Ford (855 in 1987), Moore (848 in 1989), and Heath Miller (835 in 2003) all came close by that definition. So did Zaccheaus. Last season, his 85 receptions produced 895 receiving yards. That ranked fifth all-time in a single season at Virginia. That led the team obviously and he finished second on the roster with six touchdowns (one of those was rushing) on the year. Plus, the Wahoos went back to a bowl game. That all quantifies as a strong season for Zaccheaus. Not strong enough. Not according to Zaccheaus nor his position coach Marques Hagans. After spring practice, Zaccheaus bluntly told reporters that “Realistically, I could have done a lot better” and “I left a lot of plays out there.” He added that he could have been more consistent, could do better with the tough catches, and that he could produce more by staying on his feet for more yards after the catch. That sort of determination puts a 1,000-yard season in play. It won’t be easy, though. Zaccheaus will be missing some of the surrounding pieces from his historic 2017 season and defenses will be able to possibly put more focus in his direction as a result. How will that impact Zaccheaus? Starting quarterback Kurt Benkert is now in an NFL training camp with the Atlanta Falcons. In his place, the Cavaliers plan to insert Bryce Perkins, a more mobile quarterback that’s going to get some carries by design and some by scrambling. Benkert sometimes would slide or roll out of the pocket to avoid pressure and then try to find someone open to pass the ball to in an opening. He connected with Zaccheaus on that sort of scramble drill in 2016 and 2017. That might take a few catches and a few yards away from the total if Perkins pulls the ball down and sprints for yards instead. Also gone in 2018 are Andre Levrone, now in an NFL training camp with the Baltimore Ravens, and Doni Dowling. Those two put up really solid senior seasons alongside Zaccheaus last fall at Virginia. Dowling secured 50 catches for 647 yards to rank second on the roster in receptions. Levrone caught 34 passes for 689 yards to finish second on the team in receiving yards and he led the way with seven receiving touchdowns. Dowling helped spread the field horizontally with tough catches and yards at times, while Levrone took the proverbial lid off the defense with some of his downfield routes. Their absence could take some space away from Zaccheaus depending on how defenses choose to handle things and how the counter attack with players like Joe Reed looks in those vacated spots. Regardless, McMullen might be a good point of reference for Zaccheaus this season. He posted 83 catches for 1,060 yards in 2001 over 12 games, an average of 6.9 catches and 88 yards per game. He followed that up with 69 catches for 894 yards in 2002 over 14 games, an average of 4.9 catches and 64 yards per game. Those two seasons both represented top 5 single season efforts at the time (Zaccheaus knocked the latter out of the top 5 with his 2017 effort). Some of the decrease in production likely came from defensive attention, but it opened things up for future stars Wali Lundy and Heath Miller in 2002. That duo combined for 91 catches, 762 yards, and 13 touchdowns that year. And, perhaps, more importantly, McMullen and the Hoos missed the postseason in 2001 with a 5-7 record but bounced back to finish 9-5 the next year and returned to bowl play. In fact, those Cavaliers defeated West Virginia 48-22 in the Continental Tire Bowl in Charlotte, which snapped a streak of four straight bowl game losses at the time. If Zaccheaus can accomplish something similar this season – another strong individual year, a winning team record, and stopping a streak of three straight bowl losses too – then it won’t matter if he gets to 1,000 yards or not. He’ll have a secure spot in Virginia lore.